The SLX 305 has a 0.88" diameter Type 316 Stainless steel housing and undulated stainless steel diaphragm. SLX 305-E is a three-wire device which produces a 1-5 VDC output over the transducer's pressure range. SLX 305-M is a two-wire loop-powered device which produces a 4-20 mADC output over the transducer's pressure range. The following pressure ranges are available: 5, 7.5, 10, 15, 20, 30, 50 & 100. The SLX 305 has a 0.25% accuracy. 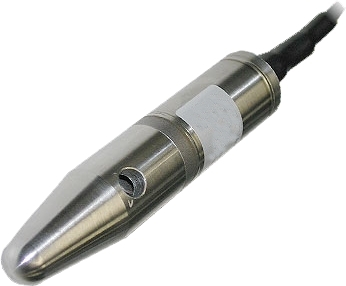 The transducer is pendent mounted (i.e. suspended) via its signal cable. When pendant mounted, the SLX 305 is appropriate for applications with low to moderate turbulence. The SLX 305 may also be secured in the tank via the transducer's integral 1/2' M-NPT fitting at the top of the transducer. The transducer may be secured to a fixes/secured length of pipe and thus held in the tank.